If you’re looking for pictures of spider bites (some are gross) or interested in awesome photos of spiders captured near beds, under toilet seats and in cloths, then you’ve come to the right place! You’ll understand which spiders are bad, what they look like, bite symptoms, and what to do when bitten. You’ll also see what happens when you do something bad like pop what might appear to be a harmless blister! If you’re not sure what bit you, simply upload a photo of your bite with details and we’ll take a look. Not all spider bites are bad, in fact, most are not, but there are a few spiders that when they bite, they do incredible damage like the brown recluse below! Entomologists have spent countless hours classifying deadly bites like the brown recluse spider bite or its less toxic relative, the Brown Widow Spider and we attempt to list the most common. Understanding the differences in spiders, how they work and where they came from is the key to proper spider bite treatment. More than 38,000 different species of spiders have been found and they have had time to perfect their deadly spider bite! A 300 million year old fossil was found that looks like ancient arachnids and is half a meter long with enormous shovel-like jaws including ribbed armor plating over the abdomen. Spiders can be found living in almost every habitat on earth. The only place that spiders are not found is only the harshest environments on Earth, the North and South poles, the highest mountains and the ocean. Some spiders have been found near the ocean, living in coral near the ocean edge. Should you find a spider in your home and wondering how deadly it really is, our spider identification will provide you with information. Spiders are something that humans have to be live with – it is said that there is a spider within three feet of us at any given time! Unfortunately, this close proximity causes us to assume that our bite was from a spider when it may have been from something entirely different; before you kill the nearby spider, review our page on insect bites to see if your bites are similar. Spiders love to take advantage of any area in a house that they can find to live. Under stairs, in nooks and crannies all over the house, in garden sheds and garages, there are many places that a human could come in contact with in and around their own home. All spiders are venomous but most have venom that is not strong enough to be dangerous to humans. In fact, having the right spiders around can actually be good thing as they eat insects that can be annoying, such as mosquitoes. All spiders bite and even though some spiders can help control the insect population, some can be dangerous to humans; the two commonly known to have dangerous venom is the black widow and brown recluse spider. The black widow is the most commonly known dangerous spider in the United States and famous for its red markings in the shape of an hourglass; they are mostly found in tropical temperatures but have been found as far north as Canada. 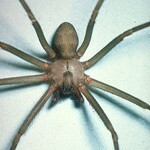 The brown recluse is another dangerous spider. 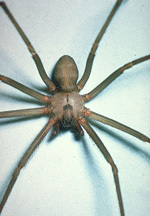 The bite of a brown recluse can be very damaging, destroys tissue and is very painful, both during the initial bite and in the hours after the bite. More about other dangerous spiders inside this site. Probably the most misunderstood insect of them all is the camel spider; solders in the desert report being chased and attacked by this hand sized creature running at 30 mph! It looks like something out of alien and is very real! Think you’ve seen a big web? If you haven’t seen this giant spider web then you should! It’s amazing how complex a spider’s web can be! Even more amazing is what the web looks like when a spider is on drugs; it’s a great way to understand just how bad some drugs can be, even to spiders. Spiders are everywhere humans are – like it or not, we’re going to have to live with them. So take a look around the site and learn which spiders are dangerous and how to treat their bites. As always, feel free to leave a comment should you have any questions!